After you write the first draft of your novel, you’ll begin the editing process. I usually wait a month or so after I’ve written the first draft before I begin editing it. I call that stage the crockpot stage. I let the novel sit in my computer and cook a little while. When I come back with a fresh pair of eyes, it’s easier to find my mistakes. After the first round of edits, I have readers check out the story to see if they like it as a whole, and I ask them to let me know of any errors they find. Then I start the process of catching “taboo” words and phrases. That’s what I call them. The words or phrases you shouldn’t use if you’re looking for a deep point of view in your story. I keep this list beside me, and I go one-by-one to check and see if they’re in the story. If they are, I rework those places. Examples: She just couldn’t take it anymore. He was just so angry he just had to slap his boss. This word is overused too often and can make the writer look a bit sloppy. Take time to express your character’s feelings. Example: He said that she was the girl that went to that church on the corner of that street near the museum. You don’t have to use THAT so much. Very and words that end in “ly” (extremely, happily, cheerfully, widely, miserably, thoughtfully, etc.) that show to what extent something is. Find a better way to express your thought. Use an action verb to show excitement or moodiness instead of “ly” words. Instead of: She suddenly fell down the stairs. Use something with more action: She carried the basket of laundry down the stairs, tripped on the carpet, and somersaulted to the platform at the bottom before she could catch herself. Avoid words that take you out of the character’s head. Instead of: She heard a tree branch scrape against the window. Use: A tree branch scraped against the window. Was a storm brewing? Instead of: She thought it was snowing but wasn’t sure. She pondered what it would be like to have a snow-covered lawn. She wished it would snow all day. She speculated she’d be snowed-in for a week. She decided to start a fire in the fireplace in case the power went out. She looked out the window and saw snow. Use: Was it snowing outside? What would it be like to have a snow-covered lawn and be snowed in for a week? She’d start a fire in case the power went out. Freezing to death was not an option. Instead of: She was unsure if he was her missing father. Use: Was he her missing father? Watch for word ending in “ing” after the word been. Example: She’d been thinking about riding the horse. Change to: She’d thought about riding the horse. Look for things that have become too trite: the lump in the throat, clearing the throat, shivers up or down the spine, the gentle kiss or peck on the cheek or mouth, the biting of the bottom lip, eyes popping out of the head. Do the eyes really pop out of someone’s head? I sure hope not. Also be careful not to use the nodding of the head. A simple nod is all you need. What else would you nod but the head? Watch for proper use of the comma. Sometimes I get confused about where to place them. Use serial commas. What are serial commas? Any time you have a series of things like colors, you want to put a comma between them. Example: A red white and blue flag should be: red, white, and blue flag. Example from my latest novel, To Laugh Once More: I leave for Georgia tomorrow to meet with several grocers about carrying our oranges, limes, and grapefruits. You do not use a comma with a conjunction unless the phrase that follows it is an independent clause. Example: He climbed up the tree, and he sat on the branch. You would not use a comma if the sentence read: He climbed up the tree and sat on the branch. Put a comma after yes and no. Another word that I go through and check on is ONTO. When do you use ONTO and when do you use ON TO? Use two words if it follows a verb. Example: He jumped on to the stage. Use one word if it doesn’t follow a verb. Example: He threw his trumpet onto the stage. 10. Check for redundant verbs like: nodded, frowned, and jumped followed by an adverb. Example: She nodded in agreement. If she’s nodding, we can assume she’s agreeing. Example: She frowned with sadness. If she’s frowning, she’s probably sad or upset about something. You don’t need to describe that. The same goes with jumping. If someone jumps, you can assume that person is either excited or terrified because something great happened or he’s getting away from a poisonous snake that’s crawling on the ground. Instead of saying this person jumped in fear, describe what’s going on in the scene enough so that the reader already knows that person is terrified or excited or whatever the feeling is. Your reader is smart so you don’t need to state the obvious. 11. Watch out for proper use of like, as and, as if. Example from To Laugh Once More: Lydia’s feet hit the steps as if the bull from Live Oaks chased her. He’d told her a thousand times that her eyes were like blue diamonds. She moved across the room to the bedside and pulled the covers up to the sickly woman’s chin, sealing her as a small child in a cocoon. I’m going to leave you with one last bit of advice. I’m far from a professional, but I’ve learned a little bit about this writing game over the years. 12. Not only should you have people read your manuscript, you should let your computer read your manuscript TO YOU. If you’re using a word processing program like Word, the newer version has this feature. You can Google how to do it (text-to-speech). I convert my document to a PDF, then I turn on the read aloud feature. You can Google how to do that as well. Why do I recommend you doing this? With my latest novel, I read through the manuscript probably fifteen times. I also had multiple people read it as well. I was surprised when I let my computer read it to me with my earphones in my ears to block out all other sounds. I found even more errors. Spell check wouldn’t have caught these errors because the words were spelled correctly. Mother would’ve washed her mouth out with lye soup for listening to Marigold’s gossip because there wasn’t much of anything she could do to her ears for hearing it. I’ll send an initiation to my dear sisters to come for a long visit. Hopefully, you caught that I typed BUGLED instead of BULGED in the first example. I can’t even imagine what it would look like for someone’s eyes to bugle. In the second example, mother would have washed her mouth out with lye SOUP not SOAP. In the third example, she was going to send an INITIATION to her sisters instead of an INVITATION. So you see, it’s easy to make mistakes that spell check won’t catch and that you and your readers won’t catch either. The reason I didn’t find these errors was because I knew what I wanted to say. I read what my mind said I was saying. I read it before my eyes even saw it. This is a very important step. You don’t want to skip this. 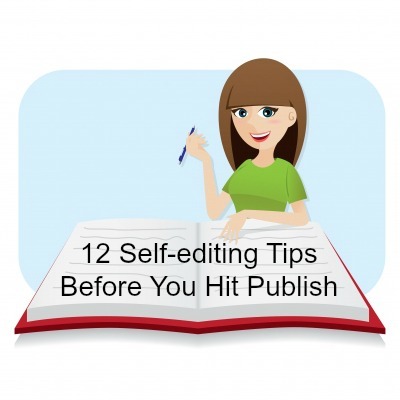 So that’s my 12 tips for self-editing (so far). I hope you have enjoyed this post. If you have some additional tips that you use in writing, please leave them in the comment section below. Thanks, Sherri! I didn’t know about the text-to-speech feature. I just set it up. Oh yay! Yes, it’s WONDERFUL! It reads slower than we can read ourselves but definitely helps you catch errors.